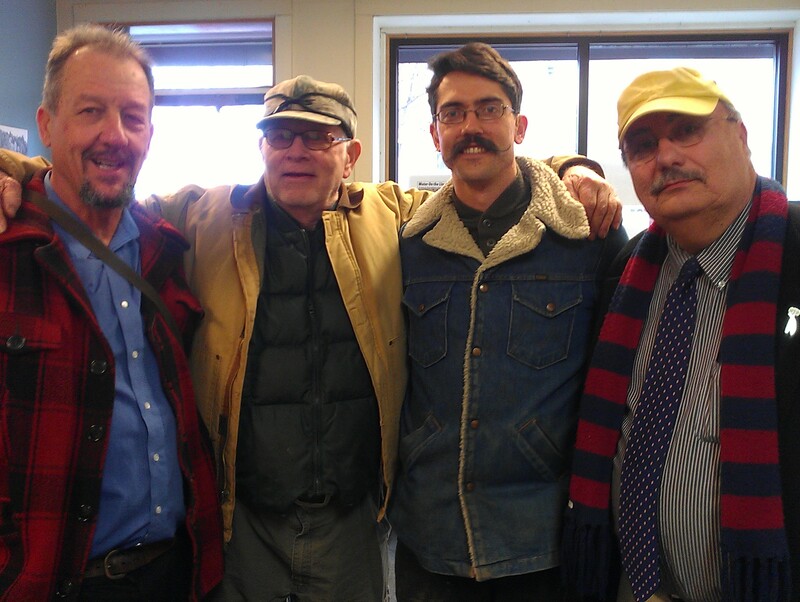 Nick Vander Puy, Joe Rose, Amorin Orion Mello and Richard Ackley celebrating the Grand Opening of the Penokee Hills Education Project office and education center. On the evening of April 5, 2013 the Penokee Hills Education Project and the Mining Impact Coalition opened the doors of their new offices and education center at 616 Main Street in downtown Ashland, Wisconsin. About 150 people attended the event, which marked the beginning of a permanent home for the community organization that was established to protect the water of the Bad River watershed. PHEP co-founder Frank Koehn was overjoyed by the reception the opening of the offices received from the community. Many who attended were concerned citizens who have been actively engaged in protecting the water, while others were new to the issue. Educational materials, maps, and information will be available concerning the 21-mile open pit mountaintop removal iron ore mine being proposed for the Penokee Hills. Mining company Gtac has stated it will apply for exploration permits within the next month. 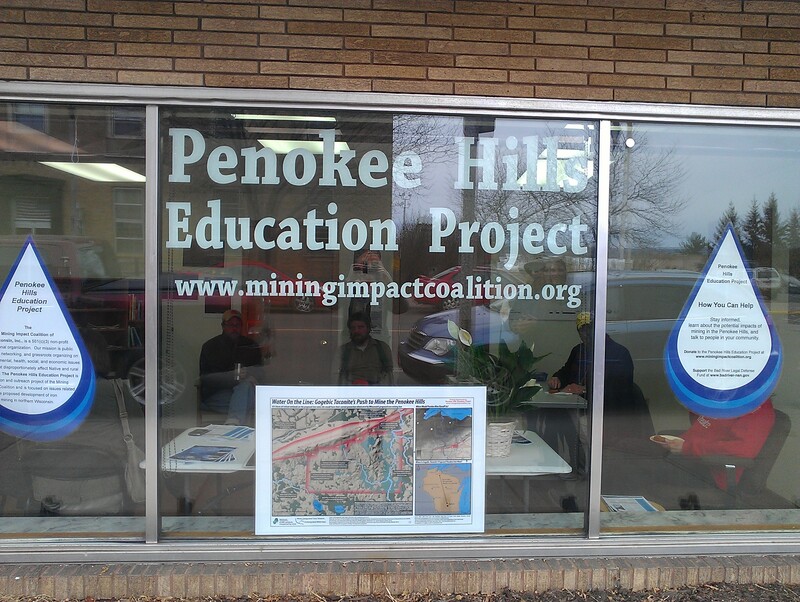 Located at 616 Main Street West in downtown Ashland, the Penokee Hills Education Project offices will be a gathering place for people from all over the state to take action to protect the Penokee Hills and Lake Superior from the devastation of an open pit iron ore mine. Wisconsin Assembly Rep. Janet Bewley (D-Ashland) praised the organization for bringing a physical presence to a fight that is sure to gear up in the weeks and months ahead. Community members are taking a variety of actions to protect the Bad River watershed from the devastation that would occur were a mine of that magnitude allowed to operate. Paul DeMain of News From Indian Country and the Lac Courte Oreilles Band of Lake Superior Ojibwe announced the opening of Harvest and Educational camp located on public lands on Moore Park Road in the town of Anderson. Concerned citizens are welcome to join in the camp, to learn about the area and the meaning of the ceded territory. DeMain also referenced sixty-three Indian allotments located directly on top of ore deposit. In the 1880s, the US government began surveying the land that was set aside for the reservations, and assigning the allotments to individual tribal members. Most Indian allotments are located on the reservations, making the presence of these sixty-three allotments in the ceded territory unusual. The Tribes are conducting and investigation into the origins of those allotments, including the chain of title going back to the Treaty of 1854. The Education Center will move to forward to solidify a regular schedule and enlist the help of community volunteers to implement outreach to other members of local counties affected by the mine. For more information, contact Frank Koehn at 218.341.8822 or Cherie Pero at 715.292.9331. See photos and video from the Grand Opening here.